If possible, I recommend using real coins and play money for bills to teach children about money. 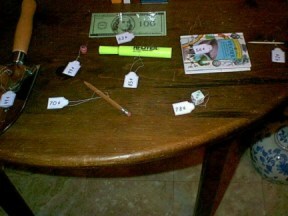 One of the fun ways to learn about money is by making a store. You can either buy tags at an office supply store or print the tags from the files below, or make your own tags.. Hang the tags on ordinary objects that are in your house. Give the children some coins and paper money and play store. Children can take turns being the store keeper on different days. The store keeper must give change if someone gives him too much money. Depending on his level, he could figure and add sales tax to the prices. The younger children who are just learning can purchase one item at a time. When they have learned how to add the coins, then they should be allowed to buy more items. Later, you can give each child a certain amount of money and ask the children to spend all of their money. This is challenging because they will need to add many of the different items in the store to discover what they must buy in order to have no money left. Play paper money can usually be found in the party supplies area of stores. Store-bought play money is nice because it is usually printed on both sides. If you can't find paper money in your area, or if you would rather not purchase play money, you can print full size play money from my Play Money web page. Play Money web page also has smaller bills that can be used for teaching place value. Printable Coins: The coin print-out (below) is provided if you are unable to use *real coins or you have not found fake coins at a store. The problem with the printable coins is that after you print it, they have to be cut out. Another problem is that the coin is not printed on the back side. * Pennies are hazardous if swallowed. If you have a baby or a child who puts things in his mouth, be especially careful with real pennies. Of course, anything small like a fake coin is a choking hazard. Print the coins on card stock. Cover the card with contact paper to made the coins easier to handle, then cut out the coins. A. Ask one of your children to write the value of the coin on the back of the coins. The tags measure approximately just under 3/4 of an inch by just under 1 1/4 inches. The area to write the price is around 1 inch wide by 5/8ths inches tall. Most of the tags are under $1.00. Just a few are over $1.00 and all of the ones that are over $1.00 are in the first file. Print the tags on card stock if you think you will use the tags several times, otherwise, print on regular paper. To Use: Print, cut them out, punch a hole in the top of each and put a string through the hole. Tag Sizes listed are approximate. approx. 1 5/8" x 1 1/8"
approx. 2 1/8" x 1 1/4"